What is the future of the university? The modern university system, created in the late 19th century and developed across the 20th century, was built upon the notion of disciplinarity. Today the social, epistemological, and technological conditions that supported the disciplinary pursuit of knowledge are coming to an end. Knowledge production has itself become unsustainable: we are drowning in knowledge even as new PhDs cannot find work. Sustainable Knowledge explores these questions and offers a new account of what is at stake in talk about 'interdisciplinarity'. Sustainable Knowledge develops two themes. First, it offers an account of contemporary knowledge production in terms of the concepts of disciplinarity, interdisciplinarity, and sustainability. Second, it reconceives the role of philosophy and the humanities both within the academy and across society. It argues that philosophy and the humanities must reinvent themselves, taking on the Socratic task of providing a historical and philosophical critique of society. Thoreau sketched out the basics of a disciplinary approach to knowledge production. It’s an approach that, whatever its merits, is breaking down today. Increasingly academics find their productions criticized and dismissed, their work habits called to account, and their funding cut. Society, it seems, feels like it is getting a poor return on its investment in university research. 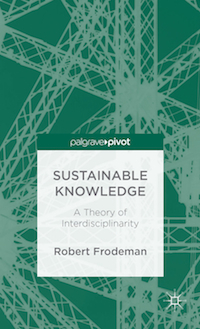 Sustainable Knowledge offers an account of this trajectory, the growing quandary in academic knowledge production that reveals itself in terms of the demise of disciplinarity. It is a predicament that manifests itself in a number of ways: as a crisis of knowledge overproduction; as a lack of larger relevance and social applicability; and as the forfeiture of authority, autonomy, and status among academics of all types. Take the crisis of overproduction. Books and articles are seldom read with the care that’s gone into the writing – itself an arcane skill perhaps soon to disappear – for no one can possibly keep up with the volume of material being produced. Our earlier way of dealing with disciplinary overabundance, through subdivision, Adam Smith applied to academic life, has been swept away by the deluge. There is too much knowledge in every subfield. This combines with the fact that today many of the problems we face are deeply integrative in nature. The result: disciplinarity has become ineffectual, anachronistic, and defunct. It remains to be seen if interdisciplinarity can be any more successful. This by design is a short book. One should expect no less for a volume concerned with the overproduction of knowledge. I have tried to make each sentence worth the reading, and to limit the narrative to matters where I have something distinctive to add. There is already a rich and varied literature on interdisciplinarity that the reader can consult; there is no need for me to reinvent those various wheels.